You asked for it, X-Fans, and now, you got it! Marvel.com asked you what Chris Claremont’s next project should be. You, the fans, said you wanted to know what today’s new generation of X-Men would be like if the Marvel Universe aged in real-time! Who are the children of the X-Men? And what happened to the original team, Professor X, and Magneto after over 30 years of conflict, victories, and tragedies? Our tale opens with X23 facing off with with five teenage mutants. 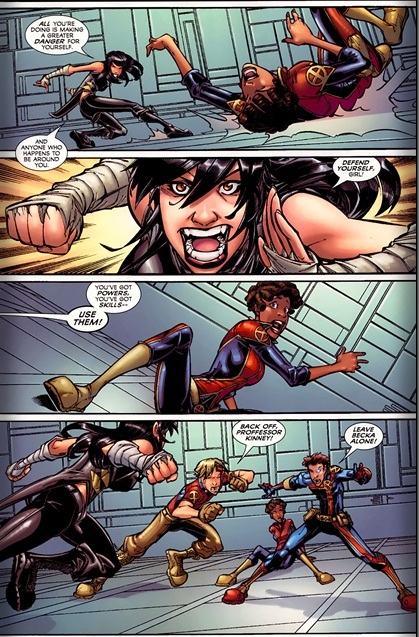 She defeats them pretty easily while Beast and his wife Cecelia Reyes watch. Becka is having a hard time at the academy so her friends take her out. Once in the club she briefly loses control of her powers. Oli helps her get control before they head back to school. 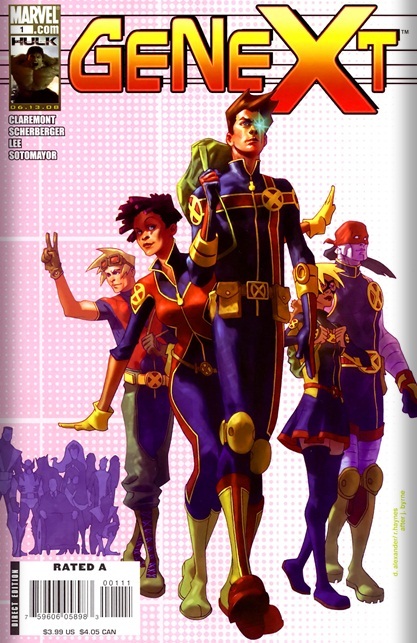 Cover- Our five new heroes are in the foreground walking into the symbolic future while in the background and distance we have silhouettes of the X-men of the past. It’s simple in its execution but symbolic as well. Art- Patrick Scherberger turns in decent artwork with distinctive characters, not the best and not the worst thing to ever grace an X-men Page. Action- This issue opens with the team taking on X23 Wolverine’s female clone that now has his personality as well. The team only reveals a small portion of their power while in battle but it’s a fun engagement nonetheless. Personalities- The friendship and bromance of Oli and Rico the children of Franklin Richards and Remy Lebeau/Gambit respectively, Becka is the wildcard, No Name the mysterious member who doubles as the chatterbox akin to 90’s Jubilee and Pavel Rasputin is the strong man who seems similar to grandfather Colossus in not just power but personality. Black Hero- Meet Becka Munroe the daughter of Storm/Ororo Munroe who grew up in the savage land and has a history with Pavel Rasputin grandson of Colossus. Also making an appearance is an older Cecelia Reyes-McCoy wife of Beast and mother of his children, Miguel, Francesca and Ciaran. Not Clear- First problem was the lack of background information on each of our main cast. Claremont should have opted for a small text box detailing the lineage of the main cast and their power set. For a book set in the future the first major hook for new readers is who the parents are and which powers the cast possesses. The supposed mystery Claremont has brewing leaves his team with no real “hook” to latch onto and that clearly hurt sales and interest preventing this book from achieving X-men class sales figures.